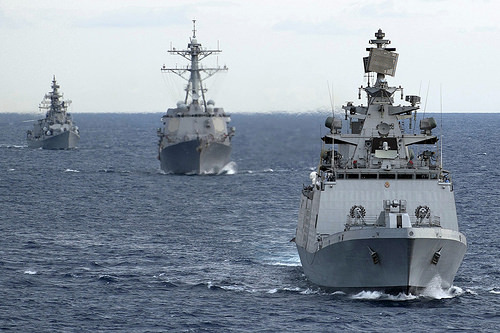 The 2014 edition of Malabar exercise kicked off on July 14, 2014 in Port Sasebo, Japan. The MALABAR series is an annual exercise involving frontline ships of the Indian and US Navies with occasional participation by Navies of other countries. Japan is participating in the exercise for the third time this year. Three ships of Indian Navy - INS Ranvijay (guided missile destroyer), INS Shivalik (stealth frigate) and INS Shakti (fleet tanker) - entered Port Sasebo on July 23 to participate in the exercise. The ships sailed to Japan immediately after wrapping up Indra 2014 exercise between the Indian Navy and the Russian Pacific Fleet. The Japanese Navy is participating in Malabar 2014 with 2 destroyers, 1 P-3C Orion and 1 US-2 sea plane. The US contingent comprises one SSN, two destroyers, one tanker, and one MR aircraft. The shore phase of Malabar 2014 will be held from July 24, 2014 to July 26, 2014 and will include interactions between subject matter experts and professional exchanges. The sea phase of the exercise is scheduled from July 27 to July 30 and will be conducted in the Western Pacific Ocean. Exercises planned during this phase include search and rescue, helicopter cross-deck landings, underway replenishment, gunnery and anti-submarine warfare, Visit, Board, Search and Seize operations (VBSS) and Liaison officer exchange and embarkation. The scope of MALABAR exercise includes diverse activities, ranging from gun-firing and fighter combat operations from aircraft carriers, to combating terror, through Maritime Interdiction Operations exercises. The Malabar exercise series commenced in 1992. Following India's 1998 Pokhran II nuclear tests there was a long hiatus. The exercise - earlier held in the years 1992, 1995, 1996, 2002, 2003, 2004, 2005, 2006, 2007 (twice), 2008, 2009, 2010, 2011, 2012, and 2013 - has grown in scope and complexity over the years.